The frame "PMTs" contains a table with list of pressuremeter tests (PMT). The results of pressuremeter tests (PMT) can be imported into the program by inserting the file in different formats (eg. *.TXT, *.CSV, *.XLSX, *.ODS). 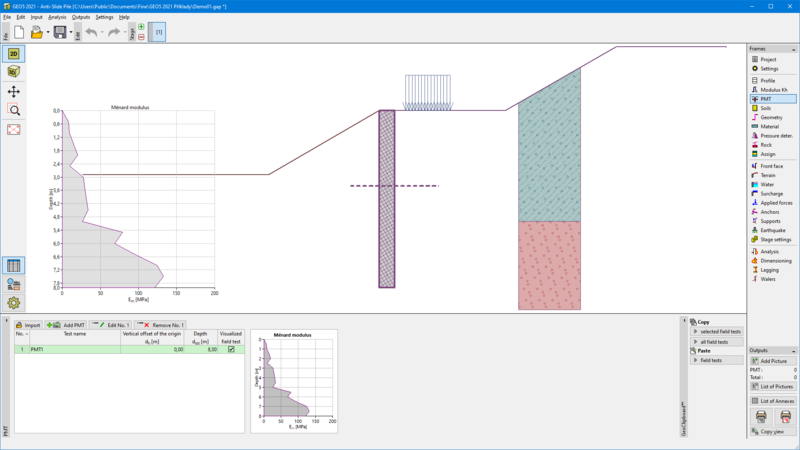 Data of PMTs can be copied within "Micropile", "Sheeting Check", "Anti-Slide Pile", "Spread Footing CPT" and "Stratigraphy" programs using "GeoClipboard". Note: The frame is accessible only in the case, when an option "pressiometer PMT" is selected for determination of subsoil reaction modulus in the "Settings" frame (the "Pressure Analysis" tab).